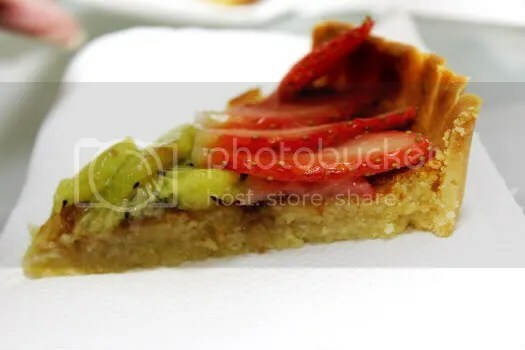 Tarts are another creation that are so simple to make but again, heavily overpriced commercially. It’s probably due to the tedious steps involved but really, it’s so easy to master! Tart dough and it’s filling (whether a simple custard or frangipane) can be prepared beforehand and refrigerated therefore making it another suitable dessert to make when you invite friends over for tea. Typically, I use a sweet oil tart dough from La Tartine Gourmande simply because oil is so much easier to handle. The thoughts of hand churning the butter ( my hand mixer is in a terrible state and I hate the fact that it does not manage to churn everything evenly) usually throws me off so I like to search for dairy-free recipes. Yet when I stumbled upon this tart dough recipe by Pierre Herme in Tartelette and again in Evan’s Kitchen Ramblings I knew it was time to give it a shot. The king of pastry can’t be wrong can he?! 1. to make the pâte sablée, sift the flour and icing sugar separately. 2. in a mixing bowl fitted with the flat beater attachment, whisk together eggs and butter and vanilla extract until just combined. add in the icing sugar, followed by the ground almonds. whisk until the mixture is well corporated, about 3-5 mins. 3. add the salt, if using and flour and mix until the dough is roughly combined and leaves the side of the bowl. do not overmix. 4. form dough into a ball and wrap in cling film (saran wrap). The dough should not be sticking on the sides of the bowl. If it is too moist, add more flour. Don’t be surprised if you add quite a lot! It should turn out like plasticine. Refrigerate for a min. of 1 hr. 5. roll dough out to about 0.5cm in thickness, line them in tart rings and refrigerate for 30 mins. prick holes at the bottom of the dough with a fork and fill them with baking weights and bake blind on 180C for 15 mins. remove weights. 6. keep the oven running and prepare the creme d’amandes. place the butter, honey, ground almonds and eggs in a large bowl and whisk until smooth. add the cream but stir in it instead of whisking so as not to emulsify it or it will rise while baking. 7. pour mixture into the tart crust and bake for another 25-30 mins until the tops are browned and filling cooked. 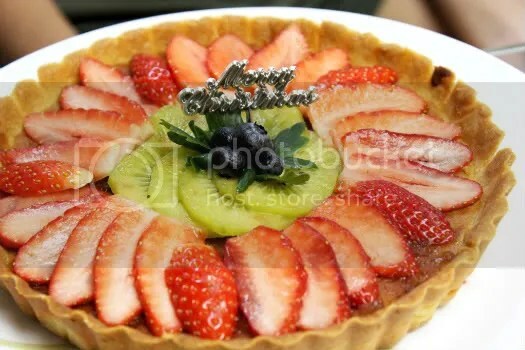 8. let cool and brush with a layer of raspberry jam and decorate with berries and fruits of your choice. We rolled out a really thin crust as you can see to give it a crackly outer layer. There is a little trick that I always employ whenever I am making tarts, learnt it from the show by Rachel Allen ‘Bake!’. It’s an excellent technique. Basically you sandwich the refrigerated dough (makes it easier to handle it you refrigerate it or you might find it too sticky/ it breaks apart easily) between two high sheets of cling wrap and roll it out into a sheet using your rolling pin. It’s easier if you split the dough into two so that it’ll be more manageable when you roll it all out and when you have to lift it up to drape it over your tart pan. 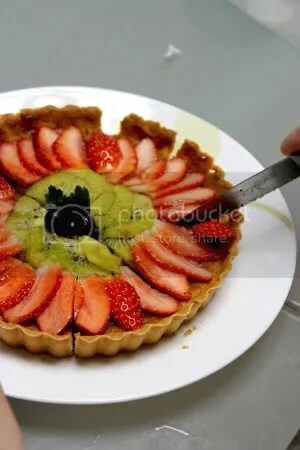 Remove one layer of cling wrap before draping it across the tart pan- no worries if it tears while you do so, you can easily patch up the holes with the remaining dough. Press the dough filling up all the crevices in the pan before removing the excess. Then remove the remaining top layer of cling wrap and patch up! Of course if you can do it the traditional way ( rolling out the dough and dusting it, lifting it up by the rolling pin and draping it onto the tart pan) all’s good. But if you are like me (lazy to try the hard way :P) use the clingwrap method. In fact, I think it’s moreprudent to do so because (as Rachel Allen highlighted in her show) furious dusting of flour to prevent the dough from sticking to the pin may affect the dough as you are essentially adding more dough than what it needed. If you like the tart crust less crisp but more buttery and soft, I suggest you roll a thicker crust and you watch your time carefully. I liked how ours turned out- a crisp shell. The frangipane/creme d’amandes filling smelt lovely because of the wild flower honey used. The fruits used were fresh and good enough on their own (kudos to our lovely fruit seller, I don’t know what I will do without him)- sliced korean strawberries, ripened green kiwi and blueberries- no need for any syrup!